Friday, February 1: BC Ombudsperson sends a mobile investigation team to Richmond. Do you think you have been treated unfairly by the provincial government, your local government, or another public organization in BC? If yes, we may be able to help. We are currently scheduling in-person appointments to hear your complaints. All appointments are free and confidential. Get more information here. February 1 – 23 (various dates): UBC’s Peter A. Allard School of Law presents two events at the University of British Columbia, Vancouver. February 5 – 26 (various dates): Seniors First BC presents two workshops in Vancouver and Richmond. February 7 – 14 (various dates): People’s Law School presents free classes for the public in Burnaby. February 7 – 27 (various dates): Plan Institute presents information sessions and workshops by phone/computer and in Ladner & Vancouver. Thursday, February 7 (11:00 am – 1:00 pm) Wills, Trusts, and Estate Planning Workshop – Plan Institute Office, 312 Main Street, Vancouver. Cost: $65.00 per person or $90.00 for two. Thursday, February 21 (10:00 am – 12:00 pm) Registered Disability Savings Plan (RDSP) Info Session – Plan Institute Office, 312 Main Street, Vancouver. Cost: free. Thursday, February 21 (7:00 – 9:00 pm) Wills, Trusts & Estate Planning – Delta Community Living Society, Ladner. Cost: $5.00 (families) and $20.00 (professionals). Closing date for registration: Monday, February 18, 2019. For more information, contact Si Stainton, Family Services Manager at sstainton@dcls.ca or 604.946.9508. Wednesday, February 27 (7:00 – 9:00 pm) Registered Disability Savings Plan (RDSP) Info Session – teleseminar by phone/computer. Cost: free. February 12 – 26 (various dates): Amici Curiae presents LEXtures 2019 in Vancouver (also via webinar). Tuesday, February 12 (5:30 – 7:00 pm) Tenancy Law: An Overview – Justice Education Society, 260 800 Hornby St., Vancouver. Cost: free (volunteers & institutional partners rate, Amici Curiae friends rate)/$105 (single-seat rate). Tuesday, February 26 (5:30 – 7:00 pm) Animal Law – Justice Education Society, 260 800 Hornby St., Vancouver. Cost: free (volunteers & institutional partners rate, Amici Curiae friends rate)/$78.75 (single-seat rate). February 14 – 20 (various dates): MOSAIC presents various workshops in Burnaby, Surrey, and Vancouver. Wednesday, February 20 (9:00 am – 12:30 pm): Vantage Point presents Understanding the Societies Act Part I: Legal Basics for BC Societies in Vancouver. This workshop reviews the key foundations of the Act and how it affects the ongoing work of your board and organization. Cost: Member- $95.00; Non-member- $110.00. City of Vancouver Bursaries available. 1183 Melville Street, Vancouver. Get more information here. Thursday, February 21 (12:15 – 2:15 pm): Disability Alliance BC presents a talk on the Disability Tax Credit and Registered Disability Savings Plan at Burnaby Neighbourhood House in Burnaby. This talk is a part of Pacific Immigrant Resource Society’s EAL course on Parenting and Disability. Cost: free. To register, please contact 604-298-5888 or Valerie at vlai@pirs.bc.ca. Get more information here. 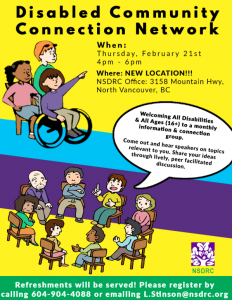 Thursday, February 21 (4:00 – 6:00 pm): Disabled Community Connection Network (DCCN) presents a group meeting about Registered Disability Savings Plan (RDSP) in North Vancouver. This group is hosted by the North Shore Disability Resource Centre, and is facilitated by and for people with disabilities. This meeting features an RDSP expert from Disability Alliance BC. Space is limited and registration is required. Get more information here. 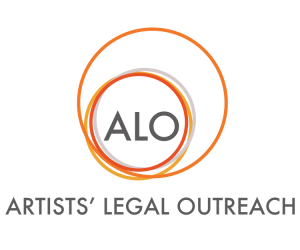 Monday, February 25 (4:00 – 5:30 pm): Artists’ Legal Outreach presents Copyright 101 in Victoria. With the massive amount of media being easily shared digitally, how do we know what’s fair to use or what others can use of ours? Recent court cases with Canadian artists emphasize the importance of understanding copyright. Presenting and accessing creative works – art, photography, video, writing, music – is easier than ever and this has major implications on how we choose to showcase our creative output. Cost: $25, students discount available. Get more information and register online here. Wednesday, February 27: Law for Nonprofits presents two workshops in Vancouver. 9:15 – 11:00 am BC Societies Act: What you need to know – Alliance for Arts + Culture, Vancouver. Cost: $50. City of Vancouver Bursaries available. Get more information and register online here. 1:00 – 3:00 pm Recordkeeping and Privacy for Non Profits – Alliance for Arts + Culture, Vancouver. Cost: $50. City of Vancouver Bursaries available. Get more information and register online here. 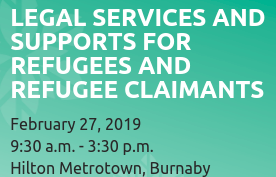 Wednesday, February 27 (9:30 am – 3:30 pm): BC Refugee Hub presents Legal Services and Supports for Refugees and Refugee Claimants in Burnaby. This training is suitable for those working in front-line positions, coordinators and managers at settlement service provider agencies, as well as community stakeholders who work with and support refugees and refugee claimants from the time they come to BC, during their claim process, when a claim decision is received an who are/become permanent residents (PRs). Cost: free. Get more information and register online here.